So for this hack, was the only thing that you had to do was change the 470 resistor to a 150 resistor? Do you still have the schematic you worked with? I'd like to check it out too! I think powering the light by USB would be awesome. 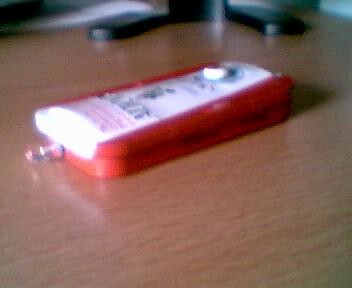 Since USB is five volts though will that make the light not as bright as the nine volt battery will? you dont need a new resistor. it will still work just wont be as bright. mine has the old 470 in it and works just as fine as changing it. Thanks. My email is carlosserious@gmail.com , elmetal. Great idea on using the USB port to power. Here's a question: USB provides 5v at 100-150mA standard, and 5V 500mA to devices that can tell the computer to supply more power. Lets say you wanted to run a whole lot of LED's off this circuit. How would you trick the computer into giving the full 500mA at the port instead of the 100mA? To elaborate: It doesn't seem to be a software application that would allow the device to request more power from the USB port, because a USB mouse runs without installing 3rd party software, although it does get a driver for the OS. I'm wondering if there is hardware onboard the device that is required to get the full power usage? can i get that same schematic email please? In order to get a full 500mA out of a device on USB, the hardware that is connected to the USB line needs to tell the USB controller that it wants 500 mA. Here is an example on how to do it with a PIC http://www.piccoder.co.uk/content/view/47/26/. is that all that needs to be done? what resistor value did you end up putting in?